What are some the next big things we will see for self-published authors? This past weekend I was a panelist at the Writer’s Digest conference in a session that focused on new developments in indie or self-publishing. Panelists included Dan Dillon from Lulu and Amanda Barbara from Pubslush, which is a crowd funding platform for authors. Moderator was Phil Sexton from Writer’s Digest. As usual, there was some lively dialogue and great questions from the audience and I always find the Writer’s Digest conference to be one of the best in the country. Being on the panel prompted me to think about what might be some of the next big things we will see in Indie or self-publishing. This past spring, we announced a partnership with Golden Apple comics to launch self publishing packages specifically tailored for graphic novel creators. About the same time, Amazon also announced a move into that space. Both are signs that graphic novel creators are going to be the next big group of content creators to take advantage of indie publishing. 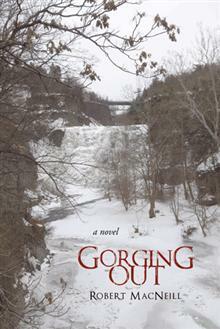 Gorging Out is a self-published novel that was recently optioned for film right. Hollywood will produce a movie based on a self-published novel. 50 Shades of Grey will be in theaters shortly and while it started as a self-published novel, its meteoric success came once a traditional publisher, Random House, picked it up. I believe it won’t be long before you will see a film on the big screen that is developed from a self-published book. In fact, recently we announced another book that was optioned by Hollywood. Link to the release is here. Stay tuned. Subscriptions will not be as big a deal as the current bluster would lead you to believe. If you pay attention to publishing news, subscription services are getting quite a bit of coverage. However, it is interesting to me that none of the news is around how many readers have signed up for the services. I think that is because consuming a book is a very different experience than consuming a song or a television show or movie. Pandora and Netflix do not require a significant commitment of time and much of what you get from their subscription services is disposable. A book is different. In the time it takes you to read a book, you could listen to one hundred songs or watch multiple movies. You can justify the value of a subscription because of the volume. I don’t think people will see the same value with books because they cannot consume them at the same rate. I could be wrong and time will tell, but it will be interesting to watch. Subscription services may lead to the resurgence of the serial. While I don’t think book subscription services will get the traction of music and video services, I do think the format may fuel a resurgence of people writing serials and introducing a new chapter or what I call a micro-book each month. It has happened yet to any measure, but I think it will and may be one of the ancillary benefits of the new subscription services. What do you think? Do you see any other big developments that I have missed? Use the comment section to let me know. → The Guardian newspaper in the UK suggests $6,000 needed to effectively self publish. Debate ensues. ← From blog to book: Westbow Press author Mark Eckel tells how he did it. Thanks for this, Keith – I just read your post at Book Country. I’m using a double-barreled approach re enhancing the written word in my humorous historical novella EXODUS, STAGE LEFT (a short sweet title, I think). 1) simple but vivid illustrations, inserted about as frequently as in a Stuart Little book, and 2) a multiple voice audio version of the novella. Still in it’s inception regarding illustration, the text is virtually complete, and the audio sample are featured in the Book Country blog that immediately preceded yours. I wonder what you think about this “middle ground” between a standard book and graphic novels. Of course, what I visualize is not a “graphic novel,” but your point about this Manga-based genre (I live in Japan) reminded me how attractive and important good visuals can be. Another fantasy I’ve had is the melding of text and, say, music video in ebooks. A longer novel I’ve written involves a lot of musical sequences and if I were the saxophonist-writer son of Bill Gates, I’d have the wherewithal to create a format where the reader takes a break from reading to enjoy a brief musical-visual recreation of such a scene in the book. It’s a delicate balance of course, but wouldn’t I love to try to execute something like that!